I've played many games in the past where I had an awesome time enjoying the fruits of the developers' labors, which were meticulously showcased in the title's gameplay, all the while absolutely detesting the narrative. Maybe the delivery was off. Maybe the story seemed good on paper but failed to deliver in execution. Maybe there was a narrator with a crappy voice and style. Or maybe, just maybe, the story was completely ludicrous and devoid of any substantial quality. Regardless of the situation, I've played many games that captured me with their mechanics but left me completely underwhelmed in the story department. That said, it's not often that things are the other way around. If a game isn't up to par mechanically, I usually don't expect anything from its story. Puzzle Agent 2 manages to do the exact opposite. Now, I'm not saying the gameplay in Puzzle Agent 2 is abysmal. It doesn't even come close. The game is actually a good deal of fun, but its puzzle design is a bit uninspired and unoriginal, making it a bit tedious at times. That said, when I played Puzzle Agent 2, I couldn't put it down, and that was because I was completely enthralled in the game's story and, to a much greater degree, its characters. So, What’s Wrong with the Puzzles? Puzzle Agent 2 is, for all intents and purposes, a credible puzzler with some solid brain teasers. Unfortunately, the experience begins to wear thin after about two hours. This is because Puzzle Agent 2 doesn't do the best job of presenting its puzzles. The game starts off simple enough, but then it quickly ups the difficulty. 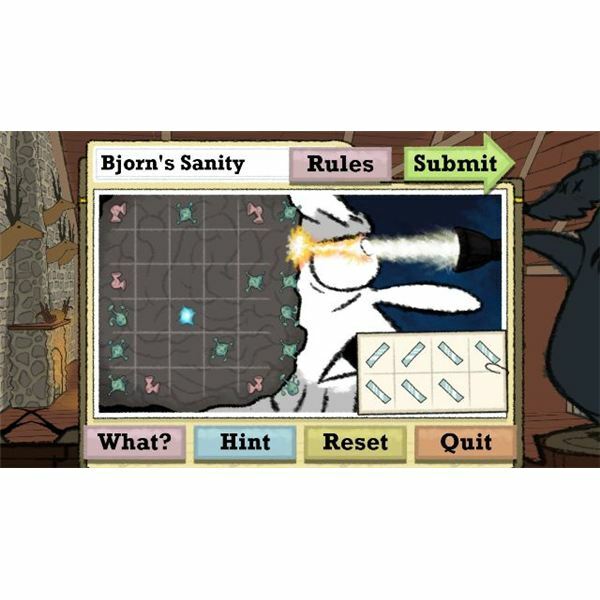 From there, the game's challenge undulates uncontrollably, and you are tasked with solving easy puzzles one moment and surprisingly challenging puzzles the next. I can appreciate a surprise or two sprinkled on my brain teaser games, but the order of challenge in Puzzle Agent 2 is too out of whack for its own good. Another issue surrounding the puzzle design in Telltale's latest is repetition. Though you won't encounter all of the same puzzles too often, there are a handful that do repeat. This is just a minor gripe, but the fact that every single puzzle isn't different–especially considering the small amount of brain teasers in the game–does make the sequel to the first Puzzle Agent feel a bit uninspired at times. Oh, and although those math puzzles are certainly not impossible, they can be kind of annoying. What isn't bad in any manner is the plot in Puzzle Agent 2. You take on the role of Nelson Tethers, the sole member of the FBI's Puzzle Research Division. As Tethers, it is up to you to discover the mystery of the missing people from Scoggins, Minnesota. While this is a fairly standard plot device, the game quickly unravels, and the missing individuals are just a small part of a "bigger picture" situation. Astronauts, gnomes, and psychotic people all round out the story in Puzzle Agent 2, and the game's quirky delivery makes the story a sheer delight to play through. While the story in the game may be a lot of fun, it's the characters that really help propel it to hilarious heights. I was surprised at how colorful each of the cast members in Puzzle Agent 2 was. From beginning to end, you encounter people who just seem to get weirder and weirder, and this makes for some interesting dialogue. It's funny seeing characters react awkwardly or nervously to Tethers' questions and remarks. And it's not just wit, either. Make no mistake about it, Tethers and the many individuals he encounters are certainly witty, but I came across several laugh out loud moments during my play-through of Puzzle Agent 2. Throughout the course of your puzzle investigation, you meet numerous people. Some of them are jittery. Others are cranky. There's even a foreign lady who takes full advantage of the comical aspect of sexual innuendo. All of these personalities combine to form one hell of a cast, and together they deliver an incredibly compelling story. Of course, the star of the game by developer Telltale is easily Agent Tethers. His clueless, wide-eyed expression is easily one of the most comical looks I've seen for a protagonist in a video game in a long time. Tethers looks like such a doofus that it's almost impossible to believe that he works for the FBI, and solving puzzles at that! Still, even though he's afraid of everything and scratches his backside all too often, Tethers is dedicated to his job, and he manages to deliver a compelling persona. Yes, this guy is a dope, but he's good at what he does and he loves it, which makes him somewhat badass in his own right. To call Puzzle Agent 2 a bad game would be a complete and utter lie. Alternatively, to call it a stellar tour de force in puzzle design would also be untrue, but I honestly can't go without recommending this downloadable title because it does manage to offer a rewarding experience despite its less-than-great gameplay. I would recommend that anyone with a penchant for quirky games check out Puzzle Agent 2. It's a short game (about four hours), but it will make for an entertaining time. Check out Puzzle Agent 2, spend a few play sessions getting through it, and enjoy the interesting little tale and amazing characters it has to offer.